Dry,(Not Alive), large acorn barnacle clusters that make good homes for your fish. Our large barnacle clusters are about twice the size of an adult male fist. Dry,(Not Alive), large acorn barnacle clusters that make good homes for your fish. They are especially good homes for blennies who naturally seek these protective wall for shelter, as well as many other fish and inverts. They can also be used for holding frags, macroalgae, or other ornamental items or just be used to create a natural look. 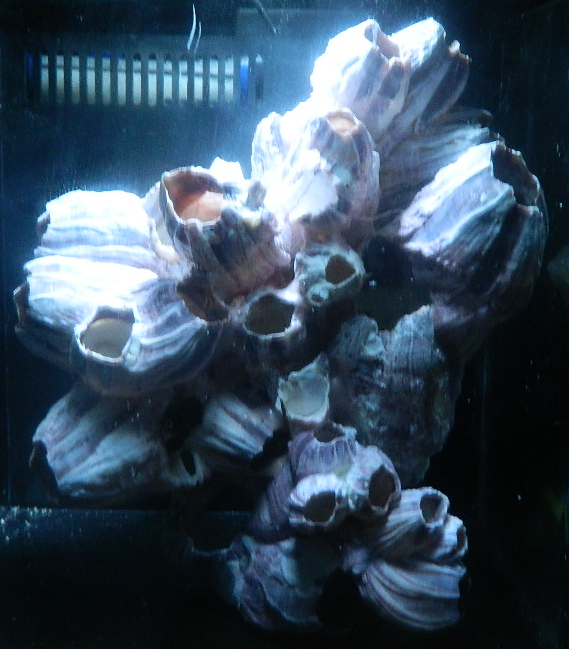 These are natural barnacles, held together at loose points with some reef safe aquarium glue. Our large barnacle clusters are about twice the size of an adult male fist. Barnacles have to be shipped separate from rock, because they are fragile and can break. They can be shipped with livestock.